I am looking on the funeral service program for one Louis Antonio Garbutt, “Sunrise September 19, 1940 – Sunset June 28, 2013,” held on Friday, July 5, in Brooklyn, New York, and many thoughts run through my mind. With each passing decade, since the massive exodus of Belizeans in the 1960’s and 1970’s reached a zenith with amnesty in the mid-1980’s, some of us who stubbornly stayed behind have shared a nostalgic vision of a day when all our long lost friends, relatives and childhood heroes would join in one big home-coming excursion, to reconnect and reminisce with their generational counterparts back in the Jewel. That would be some celebration indeed. There remains a wounded part of the Belizean psyche that psychologists can maybe explain and analyze, to figure out how it impacts on our lives as we go forward with this silent longing and yearning for wholeness and unison with the faces and voices we grew up with and who formed an integral part of our reality and sense of identity. Alas, the lives of many Belizeans in the diaspora, including some of our legends, are slowly coming to an end, and the dream has become an unrealistic fantasy, as we come to terms with the fact that folks living abroad have put down new roots in different circumstances, while Belize has grown and developed along a different path than when they left it, and their world has grown around them to a point where we have to accept the fact that there will not ever be that grand home-coming reunion after all. Some folks do manage to make the trip around September time, but for most Belizeans abroad, that is it, the past, a distant time and place, gone though not forgotten. Meanwhile, a new generation of Belizeans has grown up, here in the Jewel and in the cities of the U.S.; and they are worlds apart. Did the internet come too late to bring us back together? When he left, there was a void, and the nostalgia turned into mythology and memorable quotes from one who was idolized by more youngsters and even some of his peers than he might have realized. Many young ballers wanted to be Pele, and likewise some took the nickname “Moga,” after their hero. 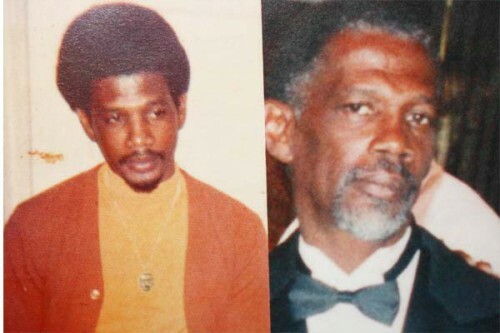 The late Charles “Jim Baxter” Ottley was one who idolized the Mugger, and was left behind in the Jewel with cherished memories. “The Mugger said, ‘quick, but no hurry,” Jim Baxter used to recount about the Mugger’s counsel on how to pass the ball. The Mugger is now gone, and the legend will live on for a while with remaining members of his generation of football players and fans, until they too pass on. His legacy will hopefully be researched and articulated to capture the essence of the man for future generations who never met him, but who will likely find themselves feeling a sense of gratitude for what he stood for, what he fought for, and what he gave in his brief time upon the stage, to sports in Belize. Courage, bravado, revolutionary, “goal getter,” show man, money player, rebel, fearless, cunning, charismatic, born leader, disciplined, warrior, dangerous, calm under pressure, warm-hearted, team spirited, humble, joyful, serious, fun loving, macho, there are many words that come to mind when trying to capture and preserve for posterity the personality that was “the Mugger.” But undeniably and most certainly, he was a man, in every sense of the word, and a man of the people and for the people. For a young man who had dedicated his life to sports, and making a living therefrom, British Honduras did not allow for “the Mugger” to respectfully realize his dream of professionalism in sports, so at 30 years he called it quits and joined the exodus in 1970, long after most of his childhood friends and teammates, and embarked on a new life in the Big Apple. Except for a brief visit back around 1983 with a “Team Belize” from New York, the Mugger lived the rest of his life in that foreign land where he joined the working population. But in Belize City, where he left his legend behind, the Mugger’s work was sports, and sports was his life. The man dies, as we all must someday, and a piece of us dies with him; but the legend lives on. R.I.P. Louis a.k.a “Bembe, the Mugger” Garbutt. Louis Antonio Garbutt was reunited with his Lord and Savior on June 28, 2013. Louis Antonio Garbutt, better known as “The Mugger,” “Bembe” and “Coach,” was born on September 19, 1940, in Puerto Cortez, Honduras, to Florence Woods and Sidney Garbutt, who both preceded him in death. He migrated to Belize City at the young age of 6 years old, where he attended Ebenezer School. As a young boy, Louis developed the art of playing football (soccer), and his passion for the game kept him at Barracks almost every waking moment. He became one of the most dynamic football players in Belize, and played on several outstanding teams such as Dunlop and Independence, to name a few, and he played with many noted football legends (some are present here today). Louis’ second passion was basketball, where “dribbling” the ball at the end of a game became his creation. Louis migrated to the United States in 1970, got married and worked hard to support his family. He was a dedicated husband and father. He touched many lives and was respected by his friends and colleagues. He will be truly missed, especially on Sundays in the park on Linden, where there was always a special seat for him near Sam’s Spot. The park was his joy on Sundays in the summer. Louis was predeceased by 5 brothers, Hubert Shaw, Lloyd Bush, Wellington Bush, Sidney Garbutt, Jr. and Frank Rivers. He leaves to mourn in his passing his wife of 43 years, Sylvia Garbutt; his children, Pamela Garbutt Hulse (Steve), Michael Haggerty Garbutt (Torkqua), Devonna Cousins (Roger), Wayne Garbutt (Weena), Paul Garbutt (Mercedes); and grandchildren Kayla Hulse, Bryce Garbutt, Nicholas Cousins, Aden Garbutt; as well as many nieces and nephews and a host of friends and acquaintances. We know that Louis is with the Lord. May he rest in peace.